Over the years I had many people come up to me asking whether I was ‘the chicken man’… After explaining that I did keep chickens, they would go on to say that they had been thinking about getting a few hens and wanted some pointers… I produced a few typed sheets for them and this was how this beginner’s guide to keeping chickens got started! To Begin At The Beginning! …you commit an offence if you don’t take steps as are reasonable in all the circumstances to ensure the needs of an animal for which you are responsible are met to the extent required by good practice. So basically, before you start, you need to be aware that chickens need some care and attention every day, just like a dog or a cat. Before buying some hens for the first time you should give some serious consideration to where they are going to live, how you will feed and water them should you go away on holiday (see Anne Perdeaux’s excellent article on Chickens and Holidays for some tips) and how you are going to keep them secure from predators, mainly the fox if you live in the UK. So you want to keep chickens in the back garden? 1The Chicken House. Once your mind is made up that chickens are for you and you can take good care of them, the next step is to think about housing. My first ever DIY Chicken House! 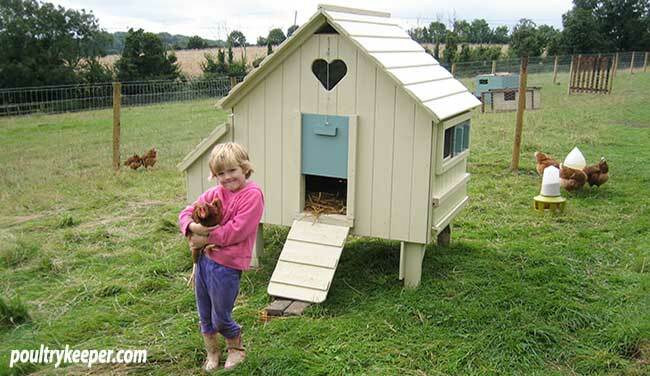 A chicken coop is probably the most expensive thing you will buy and there are many different designs on the market. It is usually a case of ‘you get what you pay for’ with wood but I have been able to keep some really cheap chicken houses going for 6 to 7 years with a regular coat of wood preserver and regular maintenance (replacing latches that rusted and roof felt that blew off in strong wind!). If you can, take a close look at the quality of the workmanship and the thickness / quality of the wood used on a coop. Obviously the better quality the wood, the longer it will last but the more the wood will cost in the first place – horse for courses! 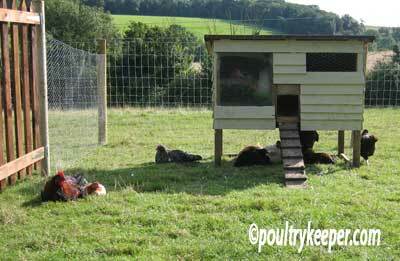 If you are on a really tight budget (sub £200) then have a look at the article I wrote on Cheap Chicken Coops. This provides some suggestions from a number of more reputable suppliers. Chicken houses can be beautiful or very basic. You could build your own chicken coop out of pallet wood, it really does not matter! As long as it does the intended job which should be to provide dry, draft free (but well ventilated) accommodation for your chickens. Wood should ideally be pressure treated so that it doesn’t rot in the first year and nails, screws and fittings should all be galvanised to stop them rusting. The first thing I do when I buy a chicken coop is paint or preserve it to give it the best possible chance of a long life. If you are treating a coop, remember to check that the product is animal friendly and leave it to dry out completely before allowing your birds into it. If you are unsure, give the customer service number a call (usually found on the back of the tin) and ask them for advice. Essential features of the house are nest boxes, ventilation (ideally adjustable) and perches for the birds to roost but you should also consider how easy it is to collect eggs and how easy it is to clean. Spending a bit more now to get a house with a droppings board and a large access door will save you hours of struggling in the long run. The bare minimum chickens need is to be kept dry, out of draughts, safe from predators and have somewhere private to lay eggs. Remember if there is no shade in your chicken run, the house may need to be used for shade by your birds during hot sunny weather too. Omlet – Famous plastic coops: easy to clean and hold their value well. Forsham Cottage Arks – (now Omlet). Traditional, well-built wooden coops. Amazon – Has a number of market place sellers worth investigating. The floor of the house can be covered with wood shavings (such as the snowflake range), straw (if it isn’t too dusty) or chopped cardboard. Straw and cardboard composts far faster and gets onto my vegetable patch quicker! I wrote a separate article on the best bedding material for chickens here. 2The Chicken Run. To keep healthy, chickens need to get outside. A chicken ‘run’ could be the back garden, or likewise a small fenced area or pen, whatever it is, it is always advisable to have the biggest run possible for your birds so that they can get as much free ranging as possible. There are many benefits to chickens in free range set-ups, the biggest being healthier, happier birds that cost you less to keep and produce more eggs. The run needs to be secure – keeping the fox and other predators out whilst keeping the chickens in. If possible, bury wire netting at least 20cm into the ground to stop predators from digging under the fence and cover the roof of the run over. Larger runs can have an electric fence where foxes are a problem. The chicken run shown here backs onto open fields and there are many foxes around. It has 3 ‘strands’ of electric tape looped back and forth – the first at low-level stops foxes digging underneath, the second is at fox nose height and together with the upper tape, stops the fox from climbing over. 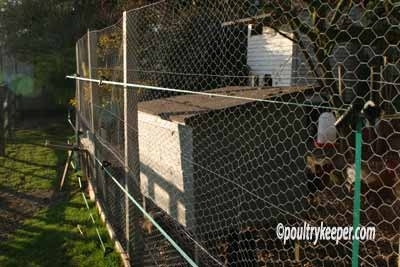 There is more information here on fencing chicken runs with the different options for small backyard runs. This article on electric poultry netting discusses the use of electrified plastic poultry netting that can be erected quickly and moved around easily in larger spaces. One gadget that I absolutely couldn’t be without are my automatic ‘pop hole’ openers and closers that lock up the chickens at night and let them out in the morning, keeping them safe. If you can afford one, I would definitely look at these, they are a very worthwhile investment and can take the worry away of you losing your hens to a fox after dark. The batteries last a year or longer. I now own 4 of these and have had them over 8 years now. 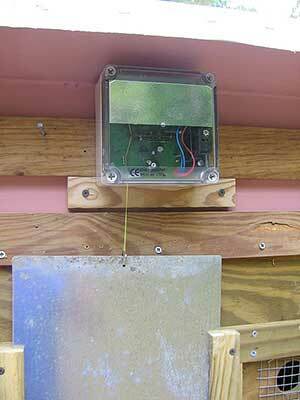 There is also a digital timer module available which can tell the VSB to stay closed until a set time in the mornings, very handy for the summer months if you don’t want your chickens out at 3am as it gets light and foxes are hunting with their young! The electronic door keeper I use is a ‘VSB’ made by AXT Electronic in Germany. I now own 4 of these and have had them over 8 years. Other than replacing a cord and the batteries (yearly), they have performed flawlessly. It opens when it gets light so there is an optional timer unit which stops it opening until a time you set. You can view automatic door keepers for sale here. 3Feeding Chickens. Chickens like all other animals need a balanced diet. During times gone by, many people fed their chickens on the household scraps and let them forage for as much as they could to get the rest. There are a number of people who tell me “My grandfather used to keep chickens and feed them on scraps alone, they’ll be alright” but the reality is that most of the time, chickens won’t be alright if fed only on scraps as they won’t get the correct balance of nutrients they need. Fortunately these days, there are feeds that have been created that contain the correct balance of nutrients, vitamins and minerals. If you want healthy birds and a good quantity of eggs, it is advisable to feed one of these formulated feeds. They are available as pellets or as a powdered mash. The mash is slightly cheaper although the chickens will usually only pick the bits out that they want, leaving the rest to go bad so all in all it is usually better to feed layers pellets. Chicks or young growers will require chick crumbs and growers pellets. Remember to allow enough feeders for your birds. There is a pecking order in chickens and sometimes the birds at the bottom will find it hard to get to the feeder if the others can stop them. 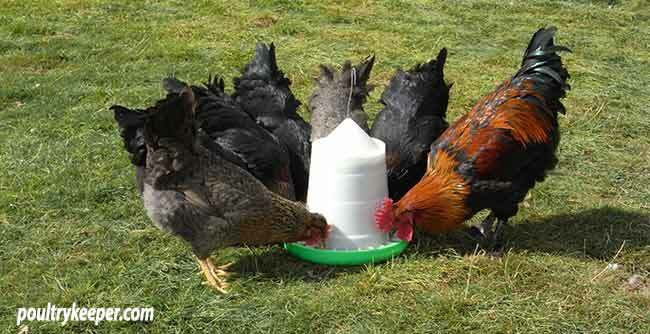 There are a number of feed dispensers available for chickens. Personally I prefer cheap plastic hoppers over expensive galvanised hoppers. They can be hung up inside the coop, or plastic rain hats can be bought if you want to leave feeders outside. They have little plastic bars around the feeding ring to stop them ‘flicking out’ the bits they don’t fancy with their beaks so there is little waste. Click here to see a range of plastic feed hoppers. According to DEFRA, you shouldn’t feed kitchen scraps to chickens but if you do feed ‘garden or allotment’ scraps that haven’t been near your kitchen… keep an eye on the quantity. Feeding more than 20% or so scraps runs the risk of egg production decreasing… and fat hens don’t lay eggs. Common plants / foods that are poisons for chickens are avocado, potato plant leaves and rhubarb. Mixed corn can be given to them as a treat – but don’t overdo it, maize (the yellow bits) is fattening. A handful per hen per day as a general guide is enough. Again – fat hens don’t lay eggs! If you need more information or are in any doubt, we have a page on feeding chickens here that should help. Flint grit and oyster shell grit are also required. The first helps them grind down the food (hens don’t have teeth – or at least I’m told they are rare!) and the second is full of calcium to help them make strong egg shells. 4Water. Lets not forget water! 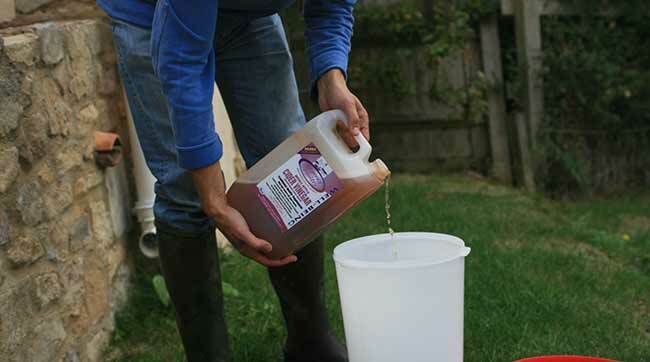 There are a number of different size water containers available suitable for young chicks through to a large flock of hens. Water containers (also called drinkers) need to keep water clean and free of droppings. They shouldn’t tip over easily and should be easy for you to clean out daily or at least every-other day. Drinkers should store enough water to last all day with some spare capacity for hot days and as a general rule of thumb I allow a litre capacity per chicken plus a litre spare. The most important factor though is that they should always have fresh water available and there should again be enough drinkers available for the birds at the bottom of the pecking order which may mean providing two water containers in different places. Apple Cider Vinegar is very good for chickens but being acidic, cannot be provided in galvanised containers without them corroding. Plastic containers are the most popular and the least expensive. Adding a splash of Apple Cider Vinegar to one of my water containers. Galvanised containers are strong, plastic can break if dropped when water is frozen but it is useful to be able to see how much water is left inside a container, especially during hot weather. Chickens cannot sweat so the only way they can lose heat on hot days is to pant or drink more water so it essential you provide this for them to stop them from over-heating. Containers should store enough water to last all day with some spare capacity for hot days. My expensive galvanised drinkers tend to stay in the shed, in favour of plastic drinkers that allow me to check the water level easily. As a general rule of thumb I allow 1 litre capacity per chicken plus a litre spare. Click here to see a range of plastic water containers. 5Hybrids or Pure Breeds Now comes the hardest part – selecting the type of chickens you want to keep! Hybrids are generally better for beginners. They are usually vaccinated, lay better than pure breeds, are friendly and aren’t too flighty. If you are thinking of getting some pure breed chickens then have a look through our Chicken Breeds section but keep in mind you may have to travel and book some rare breeds in advance. Think about what you want your chickens for. You don’t need a cockerel for chickens to lay eggs and male birds can make a lot of noise too, disturbing neighbours as well as you in the early hours of the morning – so you’ll probably want to start off with a few hens. Think about what size of birds you can accommodate in the space available – Large fowl, or bantams. Unless you have a fairly large set up then it is advisable not to mix different sized birds so that there are fewer problems with pecking. It is also best to buy all of your chickens in one go from one breeder where they have been kept together if you can, this ensures they all get along well and they will settle in faster. Introducing new birds is rarely pleasant as they re-establish the pecking order. 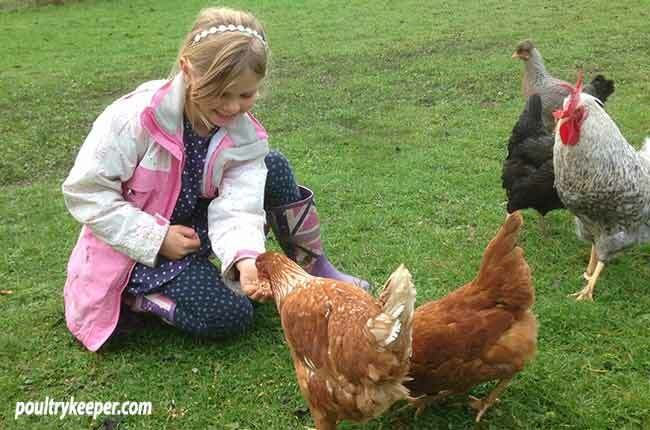 Most of all – have fun and enjoy your hens, I think you will find them incredibly rewarding. Our Keeping Chickens FAQ section contains a lot more information or click on the tag below to list all articles tagged Beginners Keeping Chickens. 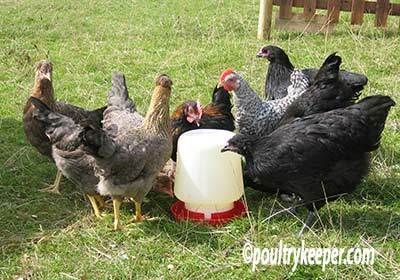 I can also recommend you read the excellent Beginners Guide to Keeping Chickens website which contains lots of useful information on how to keep chickens and a handy list of things to keep in stock as a new chicken keeper.